It's all but nearly finished, this new chook palace of ours. Taking a week to complete over a few drizzly days, it just needs a little more chicken wire and we are there. Hugo and I made it all cosy with fresh straw and the girls have moved in already. I'm so pleased we managed to recycle so much of the building materials for this shed, tin from a friend's roof that was recently replaced, timber from the stash, an old screen door from our former laundry, and my favourite, a nesting box made from solid timber kitchen cupboards that was found at the tip, for free. As the girls are settling in nicely, scratching through the new straw, my next move is to organise some medicinal plants to grow around the edges for the chooks to peck. Armed with a copy of my chook bible, I've ordered wormwood, scarlet nasturtiums, tansy, comfrey and some barley through Diggers. No hardship there - I love shopping for seeds and plants. I also plan to give the whole house a lick of lime wash, the real stuff, made from a bag of builders lime and water, which should not only keep parasites at bay, but provide a real Mediterranean feel! All we need now is the girls to lay some eggs, but I think we'll be waiting for their moulting to finish before they start to lay again. In the meantime, a pair of wooden eggs sits in the nesting box, to hopefully inspire that urge to return. Actually the girls are getting older, so I'm hoping to pick up some young new girls this weekend and our old girls can retire in style. In their white washed Mediterranean villa. I love the chook palace it looks realy cosy. What sort of chookies are those? I love their new digs - much nicer than the ramshackle construction our new girls are in! Thanks for linking to that book too, I think I need that! What a fantastic chook house! Thanks for mentioning your chicken bible - I have just ordered a copy. We are going to pick up our first chicks in a couple of weeks, I can't wait. Hope they will be as happy as yours look in their palace. Your girls look lovely. 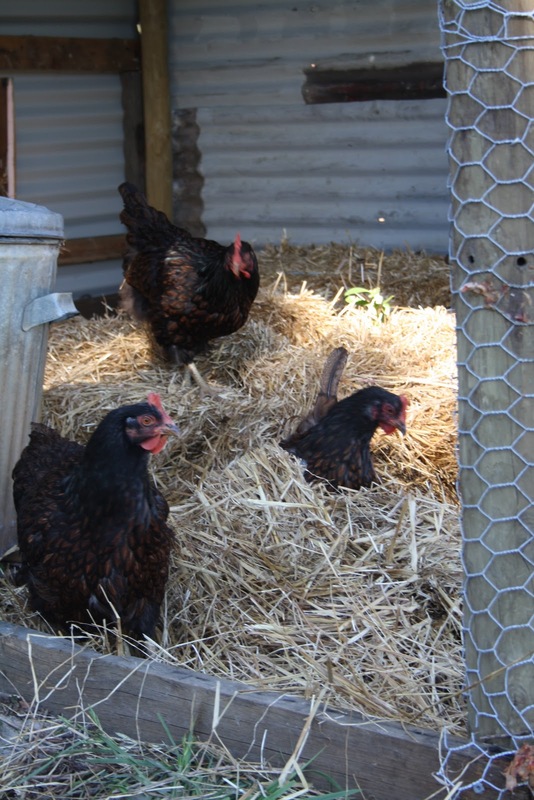 Mine are still growing their combs, but starting to look more chook than pullet! Love the house and your great idea for nest boxes. It looks amazing ... I love chooks !!! hi, i live in Huonville area too, loved reading your blogs. We made the move down here last year and are absolutely loving the lifestyle. we are about to upgrade our chook shed too, i might take a trip to the tip too and see if there is any more usable junk there. What a fine villa for your girls! Ours have a perfectly serviceable, well, ok, characterless, assembled-from-flat-pack home which they are happy to lay in, but of an evening they prefer to retire to their favourite branch of our big crab apple tree. Oh, I meant to tell you that I have THE same printers letters on my kitchen bookshelf. Actually, my E is a bit different to yours, but I still got a weird little jolt of familiarity when I saw your header! I'm sure you will have very happen hens in that house, it will look lovely lime washed. I got your magazine today, well the mag you are in, it's a lovely article and beautiful pictures, congratulations! So exciting! a most excellent chook shed. we're planning on building our next one entirely from the contents of the builders skip bin. my country style mags are handed on to me from my mother in law. just might have to hurry her along this month! it's gorgeous. And I'm going out to buy Country Style today! Talk about the Chookie Hilton - what a stylish pad Michelle! I can relate to the bit about the girls getting older & the need to pick up some new girls this w/end. That would be MOTH's dream too, but not of the chookie variety!